Those of us who aren't particularly athletic may think a regular, old-fashioned hockey game is challenging enough. But divers in southwestern Siberia have taken the sport a step further, playing upside down on the ice – while submerged underwater. Watch the video below to get a sense of how the games were played. 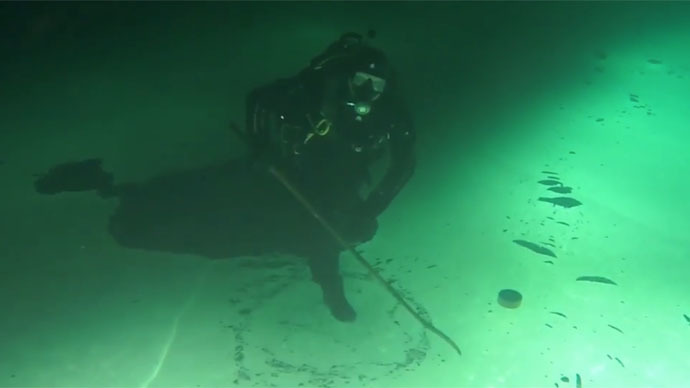 Each underwater ice hockey match consisted of two teams, made up of three people each – all of whom were equipped with scuba tanks. Players dived into the cold water through triangular gates, which were used for scoring, and played upside down on the ice. The gates were located 15 meters apart. Each match ended as soon as the first goal was scored. The Kemerovo region hosted and won the tournament. Players from the Russian regions of Kuzbass, Altay, Novosibirsk, and Tomsk also attended. Underwater visibility was 30-40 meters. The first underwater ice hockey championship of this kind was carried out in Austria in 2007. However, those players were a bit more extreme – they were forced to hold their breath during each game.